We’d love your help. 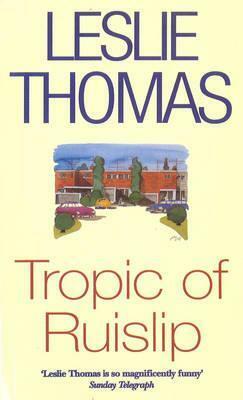 Let us know what’s wrong with this preview of Tropic Of Ruislip by Leslie Thomas. TROPIC OF RUISLIP is a sage for life on a modern executive housing estate, seething with the fears, snobbereis, frustrations and lusts of well-heeled young couples trundling uneasily towards middle age. To ask other readers questions about Tropic Of Ruislip, please sign up. "Comedy" on The Guardian's "1000 Novels Everyone Must Read"
There is always a danger that when you revisit something from the past that you loved it will disappoint. Films look cheap, games are tacky, food doesn’t taste the same and books can leaving you wondering “what was I thinking..” Nevertheless I have recently bought a couple of books that I felt deserved another look, one of them this old Leslie Thomas classic from 1974. One thing re-reading this book has made me realise is just how much of his time Leslie Thomas was. Whilst much of the humour is There is always a danger that when you revisit something from the past that you loved it will disappoint. Films look cheap, games are tacky, food doesn’t taste the same and books can leaving you wondering “what was I thinking..” Nevertheless I have recently bought a couple of books that I felt deserved another look, one of them this old Leslie Thomas classic from 1974. One thing re-reading this book has made me realise is just how much of his time Leslie Thomas was. Whilst much of the humour is timeless, and just as funny now as it was the first time around, the social commentary at the heart of the book wouldn’t make much sense to a new generation. Tropic of Ruislip, which was also made into a TV drama, centres around the residents of a new housing estate, Plummers Park, somewhere on the outskirts of London. On one side of the railway track there is the council estate with its church, shops and launderette; on the other side is the executive housing populated by the aspiring middle class professionals. The story centres around Andrew Maiby and his wife and daughter. Andrew is a journalist on the local newspaper who’s life is in a bit of a rut. The spark has gone from his marriage and his career is going nowhere. It is whilst reporting on events at the local magistrates court that he meets Bessie White, the 18-year old grand-daughter of one of the defendant. It is at this point that Andrew’s life begins to get a little complicated. Add into the mix a flasher, a proposal for a school for maladjusted children, affairs, frustrated ambitions and a vicar determined to add “Flat Roof Man” top his flock and you have all the ingredients for another suburban romp. Tropic of Ruislip is one of Leslie Thomas’s better works, capturing the middle class England and all its values, failings and aspirations. Told with great humour and more than a touch of cynicism, I loved the interplay between the characters, particularly when residents from the different sides of the track came together. For me, it was not so much the thrust of the story itself that kept me interested but the smaller events and witty asides that kept me chuckling. Leslie Thomas was one of the most popular writers of the time. Whilst I enjoyed reading this book again, I did feel it was dated. But that said, it is a great story and one that would be a good introduction for anyone who has not read his books before. I read this in my teens, so I can't remember much, except that it was about funny people living humdrum lives in a rundown housing estate. I think it was fairly "naughty" for that era, so that's probably why I enjoyed it! I read this a lifetime ago, enjoyed it then and thought I’d give it a bash again now, but I’m afraid it’s a bit dated. The book’s entitled Tropic of Ruislip, but although the author mentions certain areas around Ruislip the characters and situations read more like Chorleywood. Ruislip is more white van man as opposed to a lovely little area of suburbia. Leslie Thomas refers to ‘flat-roofed man’ several times, but in all honesty I don’t know of any flat-roof areas in the vicinity. Perhaps I’m wron I read this a lifetime ago, enjoyed it then and thought I’d give it a bash again now, but I’m afraid it’s a bit dated. The book’s entitled Tropic of Ruislip, but although the author mentions certain areas around Ruislip the characters and situations read more like Chorleywood. Ruislip is more white van man as opposed to a lovely little area of suburbia. Leslie Thomas refers to ‘flat-roofed man’ several times, but in all honesty I don’t know of any flat-roof areas in the vicinity. Perhaps I’m wrong. There are one or two affairs in the book, but they’re not exactly racy affairs. Times have moved on, I suppose, and a re-write of this book or something similar would make for a decent read, but T of R was disappointing. It could have been a lot more fun. It's OK this. Not life changing or radical. Just a well-written book with some social satire and a genuinely surprising ending. This is so of the 1970's. Different times! Selected by the Guardian's Review team and a panel of expert judges, this list includes only novels – no memoirs, no short stories, no long poems – from any decade and in any language. Originally published in thematic supplements – love, crime, comedy, family and self, state of the nation, science fiction and fantasy, war and travel – they appear here for the first time. Leslie Thomas' prose, characters and evocation of time and place are once again faultless, but in this book his plot lets him down. Unlike in the Virgin Soldier books, nothing ties together and no story really emerges from the collection of anecdotes. The ending is particularly weak. The characters really are wonderful creations, though, introduced to us beautifully, very funny, real and touching. A fairly stupid novel about a town that discovers its own sexuality. More innocent than you might expect. a little like tom sharpe, but not as good.